Because the IndieWeb feature I most want to take advantage of is syndicating content from my site, I had to apply for Twitter Developer Access. Twitter is the social media site I most frequently use. This entry explains how I went about achieving that aim. The steps for applying for Twitter developer access involve filling out a form. That's not hard, but folks who are not familiar with what fields are necessary to syndicate their content might appreciate having a clear list here. Go to Twitter developer access. Click "Create app" in the top right corner. Give your app a name. For me, it was simply "bridgestew.com". In the application description field I put, "This app will allow me to syndicate tweets from my own domain to Twitter." Provide your app/website URL. For me that is, "https://www.bridgestew.com". I skipped the fields after the website URL until I reached "Tell us how this app will be used (required)". My description for how the app would be used was, "To send my own original comments to Twitter as Tweets. The goal is to remain connected to social media, while collecting my own personal thoughts and comments on my personal website." Click on "Keys and tokens". 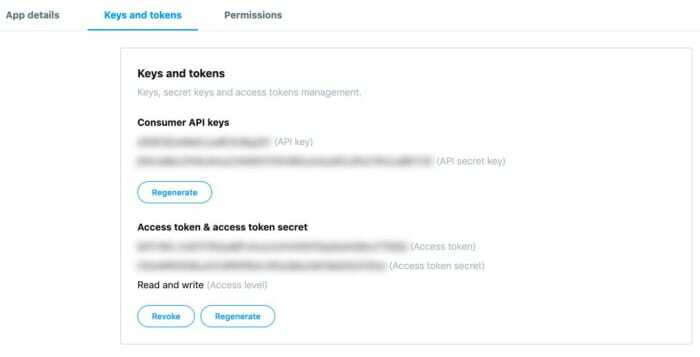 Access token & Acess token secret will need to be generated, since those are not created by default. Those 4 tokens are what you will need to connect to Twitter APIs from here on out.